tie raudoni mygtukai (http://www.skytech.lt/images/large/57/1671557.jpg) yra nuimami ir gali būti perdadami kur Jūs norite, jie įeina į komplektaciją. Sveiki, iki Naujų metų akcija dar vyks. Sveiki ,norejau pasiteirauti kiek laiko dar bus galima gauti kilimeli dovanu? Sveiki, klaviatūros kairysis Shift mygtukas didelis (ilgas). Neteisingą nuotrauką pašalinome. Dėkojame už pastabą. Sveiki, ar klaviaturoje kairysis shiftas didelis ar ne? nes vienoje nuotraukoje toks kitoje kitoks. Sveiki, deja, bet ne - reikia užsakyti. Sveiki, ar turite Kaune ? 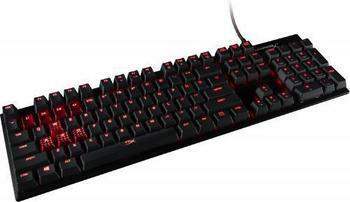 HyperXTM Alloy FPS Mechanical Gaming Keyboard features a minimalistic, compact design that’s ideal for FPS gameplay. Its space-saving layout maximizes desktop space for FPS mouse movement while maintaining full functionality and easy portability for gaming on the go. The keyboard’s solidsteel frame is built for long-lasting durability and stability. Ultra-portable, HyperX Alloy FPS comes complete with a high-quality mesh travel pouch to store and protect the keyboard and accessories for tournaments, LAN events or wherever gaming takes you. The detachable, mini-USB braided power cord reduces storage bulk and potential cable damage. For high-precision, gaming-grade key contact and reliability, it features Cherry® MX mechanical keys that use Cherry’s pioneering Gold Crosspoint technology, the world’s leading mechanical key switch technology that was designed, developed and manufactured in Germany. Their self-cleaning gold contacts make them resistant to dust and dirt, and the keys have pressure-resistant metal alloy springs. The keys are guaranteed for 50 million key strokes per key with no loss of quality or responsiveness. HyperX Alloy FPS has a convenient USB charge port to keep your phone juiced and game mode to prevent accidental interruptions, 100-percent Anti-Ghosting and full N-key rollover functionality. Its HyperX red backlit keys offer dynamic lighting effects with six preset LED modes, and it comes with additional, visually striking red keycaps with added texture for maximum control and enhanced feel.